Roslag are an endangered sheep from Sweden. They originated from the remnant populations of Swedish landrace breeds that used to be rather common all over the countryside, but are generally believed to have come from Raggaron in Roslagen, Sweden. They are small and generally white or ivory colored (although 10% of the population are black or white-black bi-colored), they are a short-tailed and are usually used in the production of wool and meat. Their wool is a carpetwool type; with long, straight or curly guard hair and a thick cover of underwool, which can be up to 30 cm long. Only the rams are horned. Ewes can lamb throughout the entire year and usually have only one lamb, but twins do occur. The average adult weight is only 35-40 kg (80-90 lb) for ewes and about 50 kg (110 lb) for rams. Although there is considerable genetic variation in most of the northern European sheep breeds, Roslag sheep, as well as Dala Fur sheep (also originating in Sweden) and Estonian Ruhnu sheep exhibit the highest within-population inbreeding due to declining numbers of the breeds. A contemporary estimated number for the population of Roslag sheep by the Nordisk GenBank Husdyr is 496 individuals. 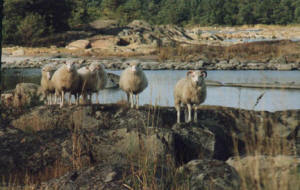 Several flocks can be found at the Boko Nature Reserve on the islands of Boko, Brannholmen and Langholmen alongside endangered Swedish Ringamala cattle. The Swedish Peasant Sheep Association represents the interests of individuals breeding Roslag Sheep and is responsible for the breed's conservation. Some owners of Roslag Sheep are members of the Swedish Sheep Breeders' Association, and thus follow the breeding plan for the breed determined by the Swedish National Board of Agriculture. The Swedish Sheep Breeders' Association registers those sheep holders who are entitled to environmental subsidies for the conservation of endangered breeds.